ABET has ISO 9001:2015 certification. That means that we are committed to total quality management: a focus on the customer, an organization-wide approach to continuous improvement, a concerted effort to understand and document critical processes, and a strong management commitment to all facets of our ISO 9001 Quality Management Systems (QMS). Many of these criteria, especially those focused on continuous quality improvement, are also at the core of our organization. By holding our accreditation processes to the same standard of third-party evaluation that ABET itself promotes, constituents can be assured that ABET accreditation is committed at all levels of the organization to providing the highest quality product to its constituents. During an 18-month period, our staff worked diligently to develop and document processes and procedures critical to maintaining the highest quality principles–our Quality Management System (QMS). ISO certification was achieved after our external auditors closely inspected our QMS for program accreditation, human resources policies and procedures, and above all, our quality process for continuous improvement efforts. 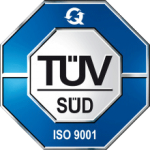 We have always prided ourselves on our approach and the high standards we set, now after our organization has undergone an audit by an expert third-party certifier, we have the external assurance that we have an established and functional QMS that meets the highly respected requirements of the ISO 9001 Standard.